Website-generated e-mails provide an important channel of communication with your users. But many web designers don’t plan properly for these emails. 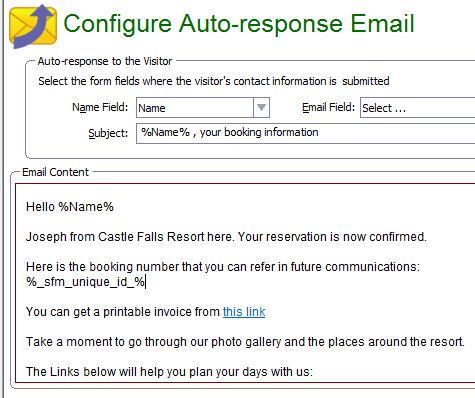 Examples of auto-generated mails include: order verification after a purchase, auto-response after completing a contact form, or registration confirmation. A close look at these kinds of mails shows that their structure, wording, and flow can be improved to make a better impression on the customer. In fact, some emails don’t even pass through the spam filter. Here are vital tips that can help you to design better automatically generated emails. Users are more likely to open a personalized email that has their name on it than a message that appears to have been sent by a stranger. Recent statistics show that the average email user receives about 72 mails daily. Hence, you need to make your message stand out so it can be read. Studies and tests have also shown that familiarity and personalization increases open rates for emails. This is probably due to the amount of spam that email users have previously encountered. In addition to adding the recipient’s first name, you should also design your email template with a very appealing subject line. For example, if you want to thank a new user for signing up on your website, your automated mail subject line could read thus: “%FirstName%, thank you for signing up, here’s your welcome package…”. This is better than simply using a subject line like: “Registration Confirmation”. Simplicity is the key to getting your users to read your emails and take the desired action. Use a simple conversational tone. But be courteous, focused and professional. Let your readers know exactly why you sent the email. Then conclude with a definite call to action. If you do a search on your inbox, you will discover several auto generated e-mails that have addresses like “noreply@sendersdomain.com”. Some emails will even state that the mail comes from an unattended mail box and you should not reply to it. The use of this type of email address is counterproductive. At least 50% of your customers will have a question to ask or a comment to make about the email you sent to them. Such customers will be put off or even abandon your service if they have to take a long route to go to your website to sign up for a support ticket. A better method is to use an email address like: support@yourdomain.com or info@yourdomain.com. This will allow you to receive quick feedback from your customers and increase their trust in your customer service. In every email you send to your customers, you should include links to your social media profile (like Twitter and Facebook), Skype and other instant communication channels. In addition, you should include links to helpful information like videos, slide shows, infographics and other resources that are relevant to the subject of the mail. At each stage of the conversion process, from prospect to repeat buyer, make sure you add links to valuable materials, reports, blog posts and other information that will make your customers love to constantly open, read and act on all your email messages. Copyright text 2018 by Simfatic Solutions.